Sanctuary In A Slipper Bath OR Shower Under The Sky. Not one but two flushing toilets in each lodge! 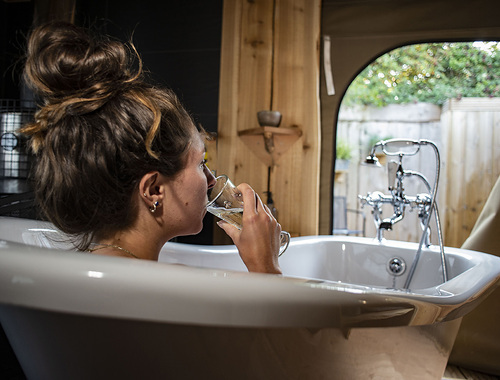 Bathroom & W.C. - features a roll-top slipper bath with shower attachment. Handmade wooden bath caddy. Wide rustic washstand with a large mirror over & shelving for your toiletries. Although we are off grid, there is still the home comfort of a flushing loo & solar lighting. The hot water is heated by the wood-burning water heater that keeps these rooms toasty warm and makes the whole lodge smell wonderful. We have fitted coat hooks & towel hooks so that there is a place for everything. Floating candles anyone? 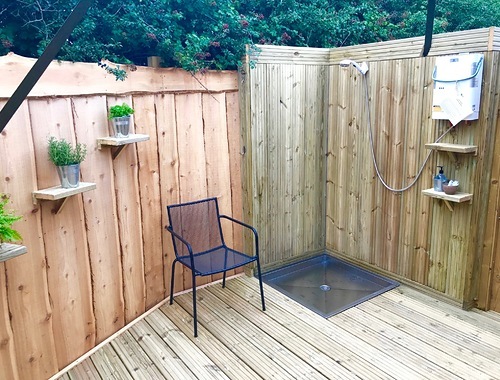 Private Outdoor Hot Shower - private decked area with a large outdoor shower - quite an invigorating experience in the open & under the skies! Washroom & W.C. - we recognise that having another place to wash is important. 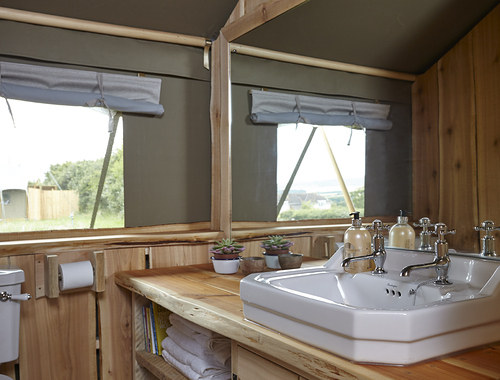 Ours has a wide rustic washstand, towel hooks and a mirror plus another flushing W.C! We supply towels and a starter toiletry kit including toilet rolls, hand wash, body wash, shampoo & conditioner.